Interior designer Melinda Hartwright from Georgica Pond Interiors is most well-known for her blue-and-white Hamptons-style taste and I can tell you that her home is simply gorgeous. 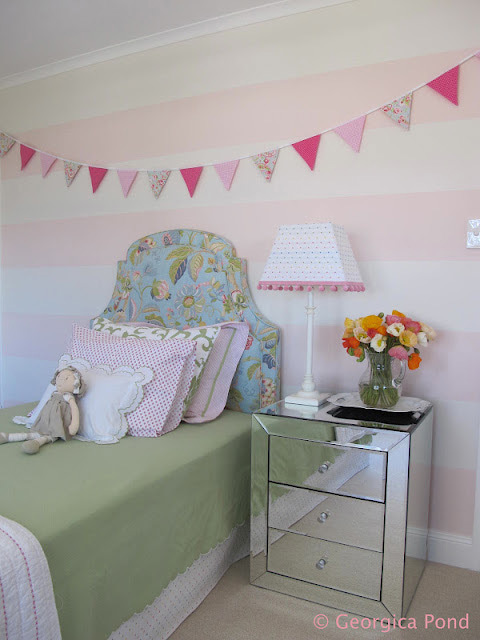 Mel has kindly shared with us her daughter Poppy's gorgeous bedroom which is equal parts sweet and chic. Mel isn't afraid to mix patterns and creates a cohesive look by keeping the florals, spots and stripes to a tight palette of pinks, green and light blue. The hot pink Victorian chair is the perfect counterpoint to the softer colours in the room, while still keeping within the colour palette. Mel amps up the sophistication level in Poppy's room with the mirrored side table and grown-up bamboo lantern - both pieces that she is sure to love right through her teen years. Bed head: designed by Mel and custom-made with San Lorenzo fabric in Sky by Westbury Textiles. 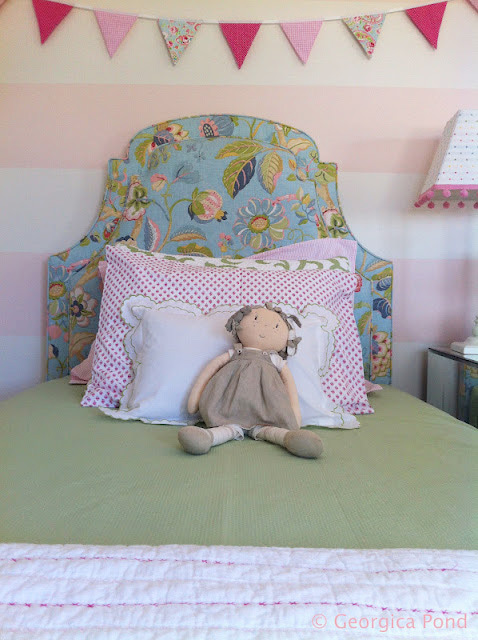 Bedspread: Green Matouk bedspread from Gracious Home in New York City. 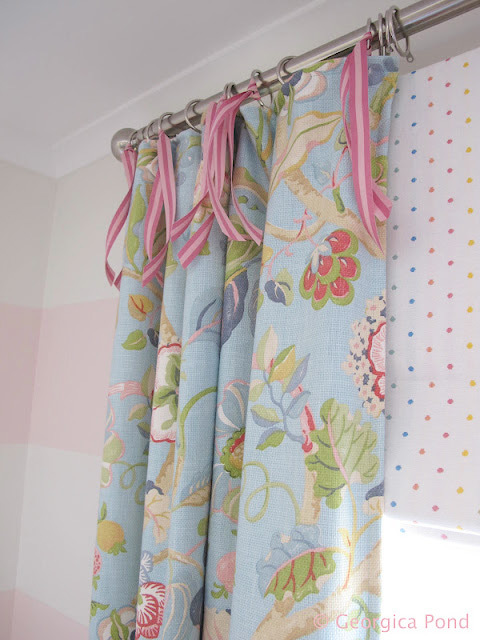 Valance: made by Mel using spot fabric from Bargain Upholstery Fabrics in Seaforth, NSW. Other bed linen: bought at Gracious Home in New York City. It’s a combination of Lulu DK, Matouk, Souleiado and the Gracious Home brand. 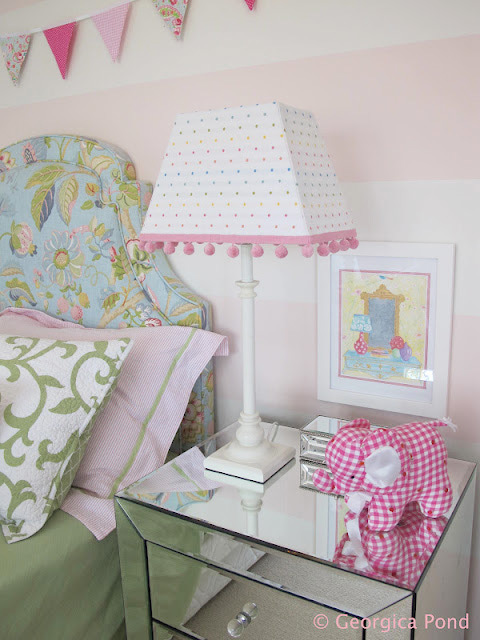 Lamp shade: made by Mel using spot fabric and pink bobble trim from Bargain Upholstery Fabrics at Seaforth, NSW. Lantern: Bamboo lantern from Shades of Light and converted in Australia. Chair: Pink velvet chair from Shack. Bedspread: White cross-stitch bedspread from Adairs. Curtains: Curtain rod is from Spotlight. 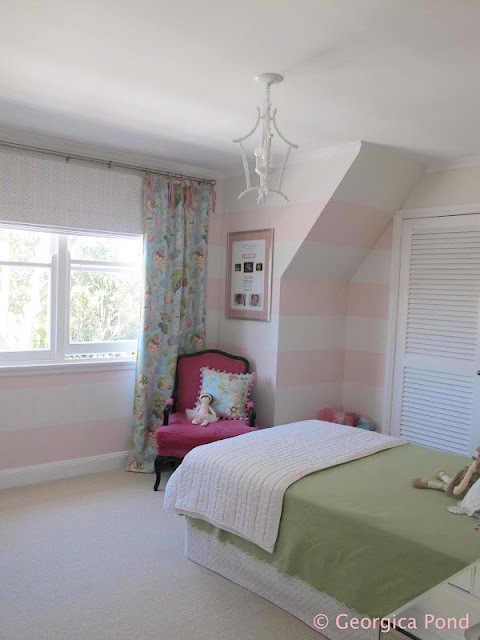 Curtain end panels made by Mel using San Lorenzo fabric in Sky by Westbury Textiles, and pink ribbon tied to the curtain rings. Name wall decor: Personalised name decor made at children’s boutique Little Steps in Bowral, NSW. Painted pink by Mel. Bookshelf: Dollshouse bookshelf from Treehouse. Wall prints: Driftwood Interiors. 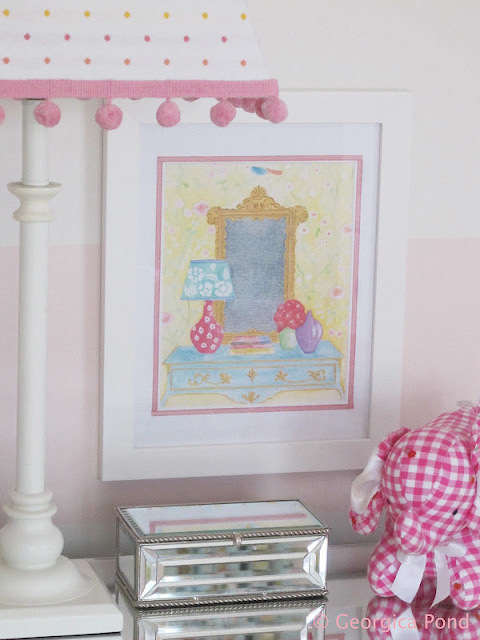 Mel added ribbon around the prints before framing then in white frames from Target. 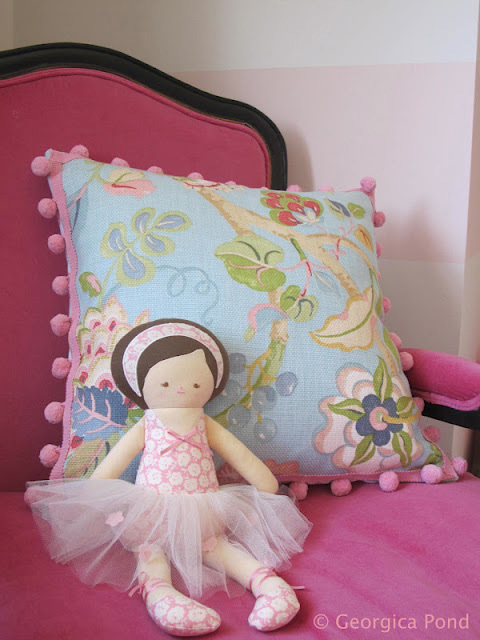 Cushion: Made by Mel using San Lorenzo fabric in Sky by Westbury Textiles. Thank you so much Mel for sharing Poppy's room with us! 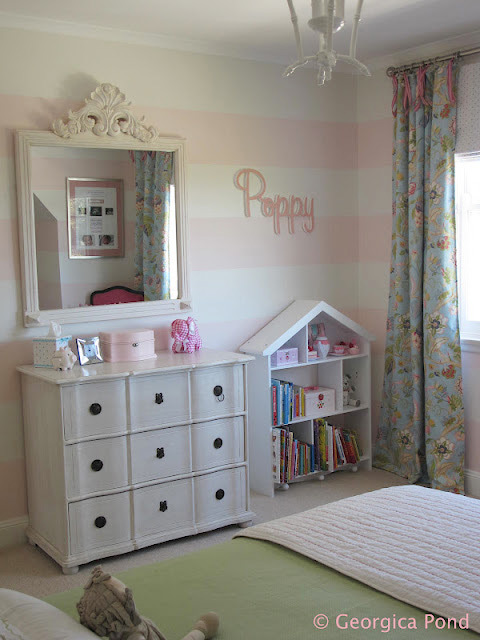 For more photos from Poppy's gorgeous room, including full before and after photos, tutorials, tips and tricks, head to Mel's blog Georgica Pond. 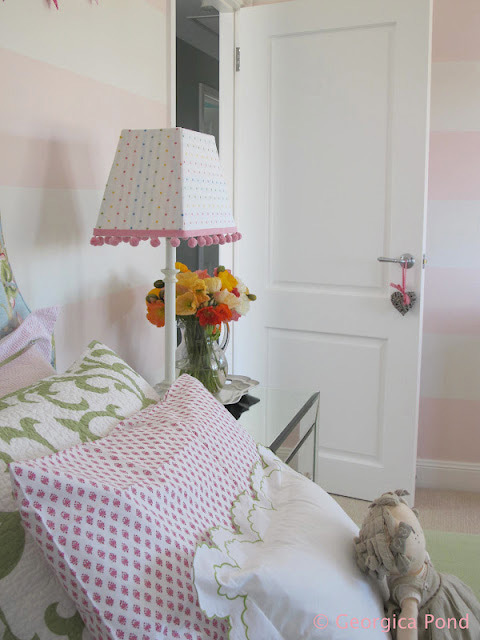 Thanks for the lovely post on Poppy's bedroom Steph and your kind words. Looks great. 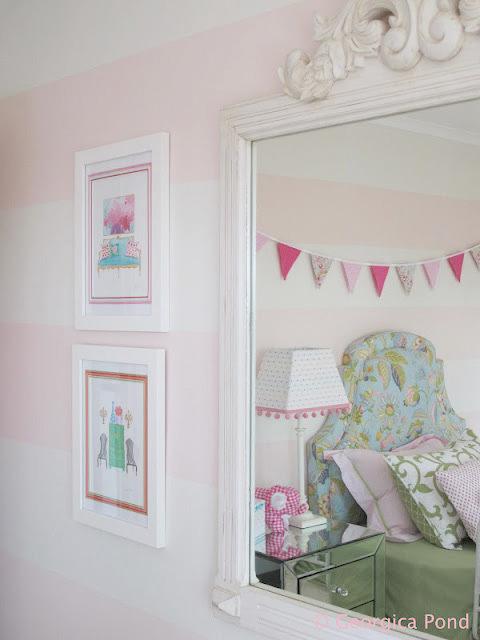 I love everything about Poppy's room! I posted a pic of it to my Pinterest and it the most repinned image I have. Just gorgeous!